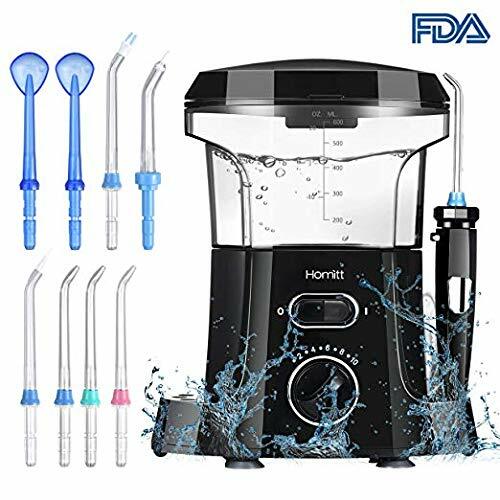 Homitt Waterproof Water Dental Flosser!! Sweet Deal!! FAMILY DENTAL CARE: 9 multifunctional tips with 5 functions include 4 jet tips clean where tooth brush can not easily touch; 2 tongue cleaners support clean coating and bacteria on the tongue; 1 orthodontic tip removes food debris in the brace; 1 dental plaque tip removes dental plaque and food debris at hard to reach area; 1 periodontal tip rinse and massage deep below the gumline. Best choice for whole family to floss. HIGH EFFICIENCY: Homitt electric water flosser supports 10 pressure settings from low to high. 1400 pulses per minute water pressure is delivered by oral irrigator.The most suitable and comfortable model can be chosen. More effective for tooth cleaning, bad breath, cavity, toothache, and dental plague. Home and travel use. SAFE AND LEAK-PROOF: Quiet oral irrigator is made of durable ABS (Acrylonitrile Butadiene Styrene) material and 110-240V dual voltage. 4 suckers on the bottom of oral flosser, station more adhesion when use in the washroom, avoid slide accidentally. Cover on the top features a sealed and separated grooves which supports clean storage. Special design can hold water reliably for leak-proof. CONVINIENT TO OPERATE: Homitt dental flosser features a 600 ml water tank, enough for one time use, no need to add water when using. Paused button and 360 degree roatating knob design on the handle support portable use.